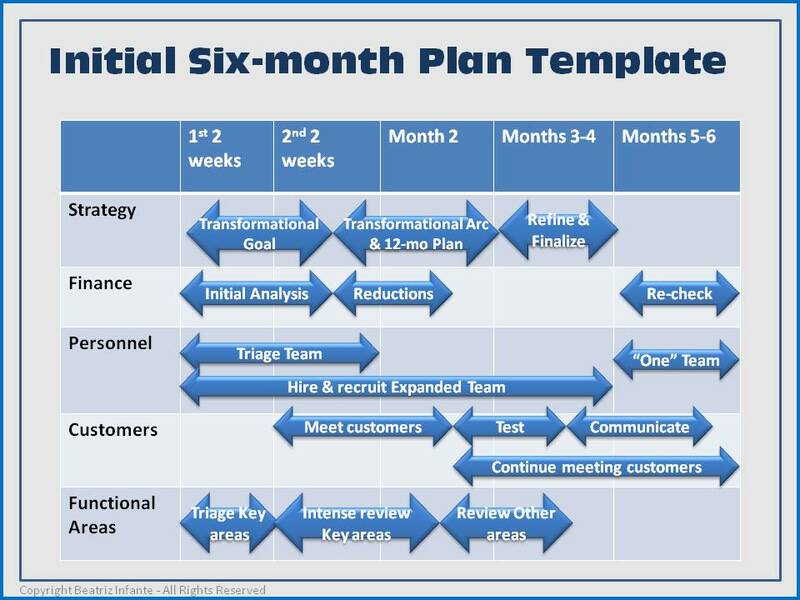 The format for the First Six Months Plan is organized as a matrix with time across the top and areas along the vertical axis. Because there will be many things you do not know initially, the timeline provides greater clarity in greater detail in the short term and is “fuzzier” as you approach the six-month milestone. So, for example, typical timelines would be: First Two Weeks, Second Two Weeks, Second Month, Months 3-4, Months 5-6. The rows consist of the key areas that will need investigation. While this will be dependent on the specific situation, typical categories would include “Strategy”, “Financials”, “Personnel”, “Customers”, “Sales”, “Services”, and “Operations”. In most cases, a good First Six Months Plan will result in clear visibility to your board or management, and a reputation will be established for both accomplishment and transparency. The First Six Months Plan is a living document. As time progresses, it should serve as a tracking mechanism for milestones met or not met, using simple visual clues. For example, highlight completed items in green, incomplete items in red or yellow, deleted items crossed out. You can even make your Six Months Plan accessible online, with click-able details for each item. As the first six months come to an end, a smooth transition to a Rolling Twelve-Month Plan as described in the section on Transforming the Business – A Three-Step Process for Business Transformation will ensure continued progress. Copyright © 2012 Beatriz Infante – All rights reserved.